According to a recent worldwide survey of over 20,000 participants, people in the developing world see the internet as more valuable to human life than medicine, clothes and clean water. The new study, conducted by Peer 1 Hosting, reveals that countries with less internet access are most likely to see the internet as a tool for social good. The Human Potential of the Internet Study revealed that countries with low access to the internet were significantly more likely to agree that the access to information, education, politics provided by the internet would improve their quality of life, going so far as to say that the internet is necessary to their survival. 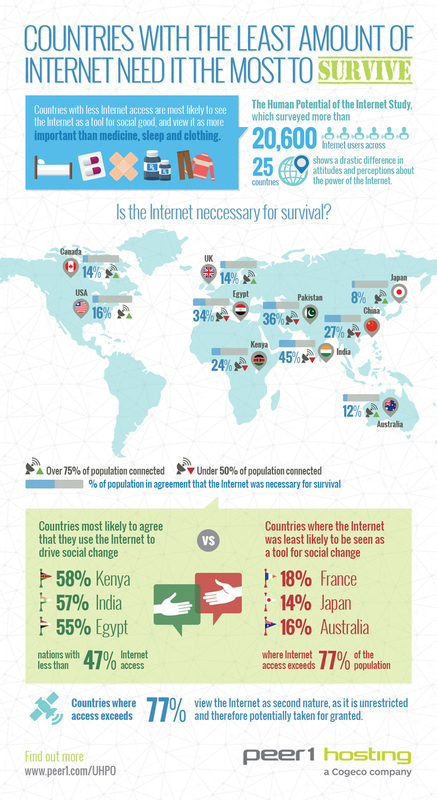 The figures show that developing the nations of Kenya (58%), India (57%) and Egypt (55%), (all nations with less than 47% internet access) are most likely to agree that they use the internet to drive social change. Whilst developed countries (where internet access is available to over 77% of the population) like Japan (14%), Australia (16%) and France (18%) are least likely to see the internet as a tool for social good. Are developing countries naïve in their view that the internet could be a tool for social good? Or has The West just got cynical?